This book treats culture as the glue that connects the units by following the story lines of a twin brother and sister learning Chinese in two contexts (China vs. US). Access Chinese provides essential tools for communication throughout the story development while at the same time engaging learners in acquiring additional vocabulary and grammar by contextualizing these elements in further communicative tasks. In Access Chinese, contextualized grammar, communicative practice, and engaging cultural information are all intertwined, creating a learning environment appropriate for the successful acquisition of the language as well as an opportunity to explore cultural contexts. The Cultural Interchange section highlights major cultural differences in communication, and in particular those unique to the Chinese context are mentioned for cultural awareness and adaptation, which is related to the contents of Episodes 1 and 2 in each unit. The new grammar of each unit is presented in a section called Grammar Kit, including three or four highlighted grammar structures with English explanations and examples of grammar usage. The Episodes in each unit are the scenarios of two story lines surrounding a pair of U.S.-born twins —Bill and Jenny— who are both learning Chinese. Each short episode introduces the new grammar in a communicative context, presents functional and conversational expressions, and reflects authentic Chinese culture and social etiquette. Each Episode is followed by one or two expanded language functions. A variety of interesting real-life materials and enjoyable activities provide students with sufficient practice and enable learners to apply what they have learned into practice. Each book in Access Chinese has a companion workbook which aims at providing learners with grammar and communication practice activities and tasks that strengthen the learning of materials in the textbook. The Pinyin and Hanzi practice at the beginning of Access Chinese introduce students to these two writing systems. These sections can also be used as a reference throughout the course as students are exposed to more specific Pronunciation issues and Chinese Character practice within each Unit. Access Chinese deals with contemporary topics that are of high interest and relevance to students and teachers around the world. The topics have been selected to reflect global perspectives that help learners become global citizens as well as local contexts that help stimulate cross-cultural awareness and discussion. Dr. Jun Liu is Associate Provost for International Initiatives at Georgia State University. Prior to taking on this role, he served as the Director of the Confucius Institute at University of Arizona and a faculty member of both English Language/Linguistics and the Second Language Acquisition and Teaching Interdisciplinary Ph.D. Program. He is also Vice President of International Society of Chinese Language Teaching (ISCLT), and Senior Advisor of The Office of Chinese Language Council International (Hanban). Dr. Liu earned his Ph.D. in Foreign and Second Language Education at Ohio State University. 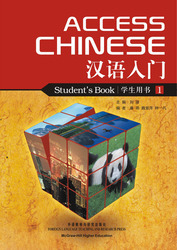 Access Chinese is his first publication with McGraw-Hill.